Orange and the Château de Versailles have released a new iPhone app, offering a new visitor experience for gardens of the Château de Versailles. Developed initially for the iPhone in English and French, It provides access to a large amount of audio and video content about the gardens. The leading specialists on the Versailles estate (curators, architects, gardeners, water engineers) welcome visitors, presenting an item of historical information, a detail about the decor, an insightful viewpoint and aspects of life on the estate otherwise unseen by visitors…This enhanced visit will enable visitors to discover the Versailles Gardens onsite or remotely. This application has been developed thanks to a joint initiative aimed at using innovation for the benefit of culture and visitors. For several years now, the Château de Versailles and Orange have been implementing projects at the crossroads between culture and innovation, under the VersaillesLab label. As a partner in this initiative, Orange is demonstrating its capacity to use digital technology for the benefit of culture for as many people as possible and to support institutions and local authorities in their initiatives to promote heritage. Further innovative projects will be developed in connection with VersaillesLab over the coming months. 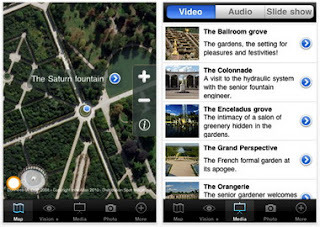 Versailles Gardens iPhone App is available for $1.99 from the App Store in the Education category. 0 comments on "Versailles Gardens iPhone App enables visitors to discover the Versailles Gardens onsite or remotely"